Thursday’s touchstone blurt has prompted three interesting comments–two of which from long-time acquaintances; one of which was left by Edward Harris, progenitor of the Harris Matrix and author of Principles of Archaeological Stratigraphy [which the author has made freely available online–just click on the title]. All three expressed dismay that any archaeological sites are still excavated in arbitrary levels, and they all added a gentle prod to the effect that I should not be so quick to accept the practice’s continued use, even for sites in California. The problem really boils down to this. California archaeologists aren’t dealing with cultural deposits in homogeneous natural sediments. 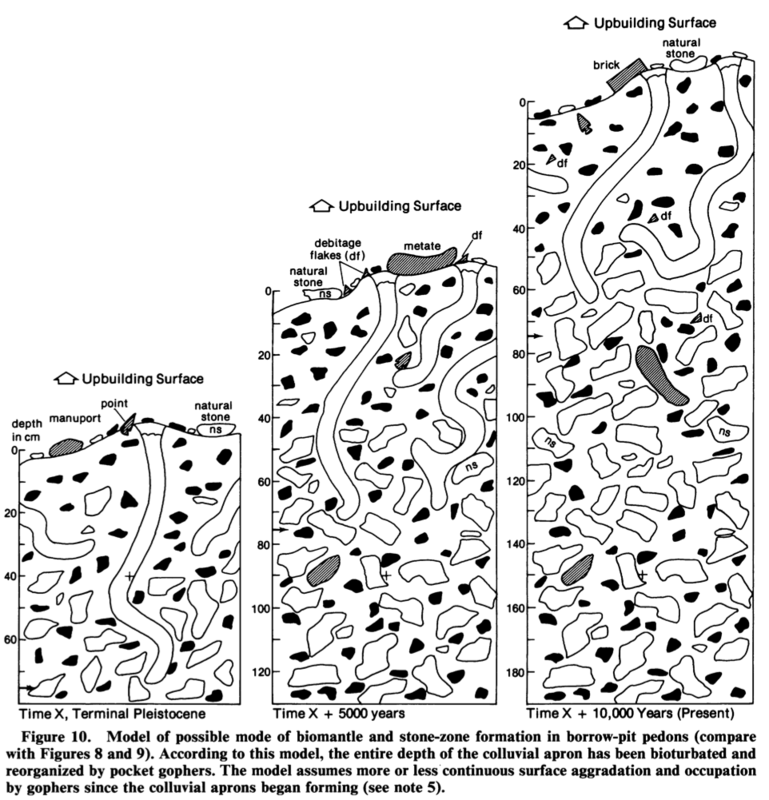 They’re dealing with completely homogenized (bioturbated) natural sediments and cultural traces. That’s quite a different story, as I’ll argue further down. But right now: nail buffing time. Here is the first one ever made and also a little article. You can post them if you like. 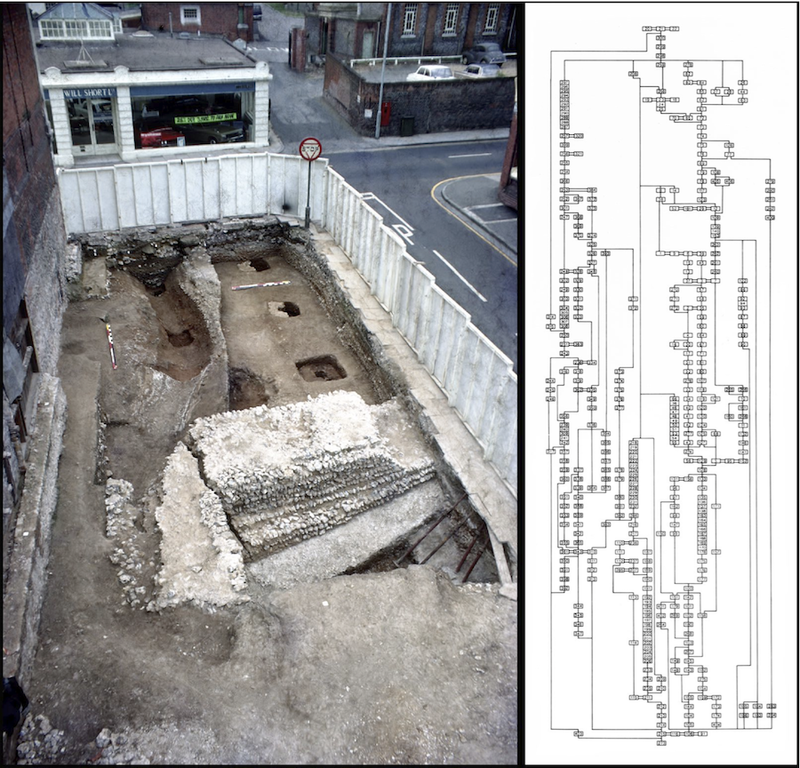 The first-ever Matrix (read, as we now know, “stratigraphic sequence”) was made in 1974 for the site excavated that year at the south gate into the Roman town of Winchester, England. First-ever Harris Matrix–South Gate, Roman Winchester, 1974 (Photo courtesy of E. Harris). In what follows I’ll try to explain (and not explain away) the conundrum faced by every archaeologist in almost any landform and at almost any altitude in California. Here goes! Regardless of the characteristics of the parent material on and in which pre-Columbian California archaeological occupation sites have formed, and regardless of the rate of aggradation throughout the period during which the cultural materials were abandoned, there is a Nemesis against which it is futile for an archaeologist to struggle: fossorial rodents–specifically the ground squirrel (Sciuridae) and the pocket gopher (Geomyidae). These animals are prodigious breeders and tireless burrowers. And because they have been present throughout the epoch of human occupation, they have had a universal and profound, time-transgressive effect on the vertical and horizontal distribution of archaeological materials in California sites. This has been documented in numerous ways and in sites across the Golden State. These animals are capable of transporting any clast smaller than their burrow’s diameter anywhere from millmeters to (eventually) meters from it original location (if that was, in fact, its ‘original’ location). At any time they are regularly disturbing the top 50 cm or so. Given their habit of pushing their backdirt upward and out onto the surface, the smaller archaeological pieces ‘liberated’ in this fashion tend to remain in the upper 10 cm or so. And larger clasts are transported generally downward because over time they are undermined and drop a few cm at a time. This can happen to boulders and everything smaller that can’t be displaced along the burrow itself. The habits and ubiquity of these rodents have ensured that no site in California, and certainly no site with a longish occupation sequence, can be expected to present observable stratification or, for that matter, a vertical column that contains the oldest traces at depth; the youngest near or at the surface. Moreover, the process size-selective upward and downward displacement I’ve just outlined means that in general there is a bi-modal vertical distribution of artifacts and natural clasts. 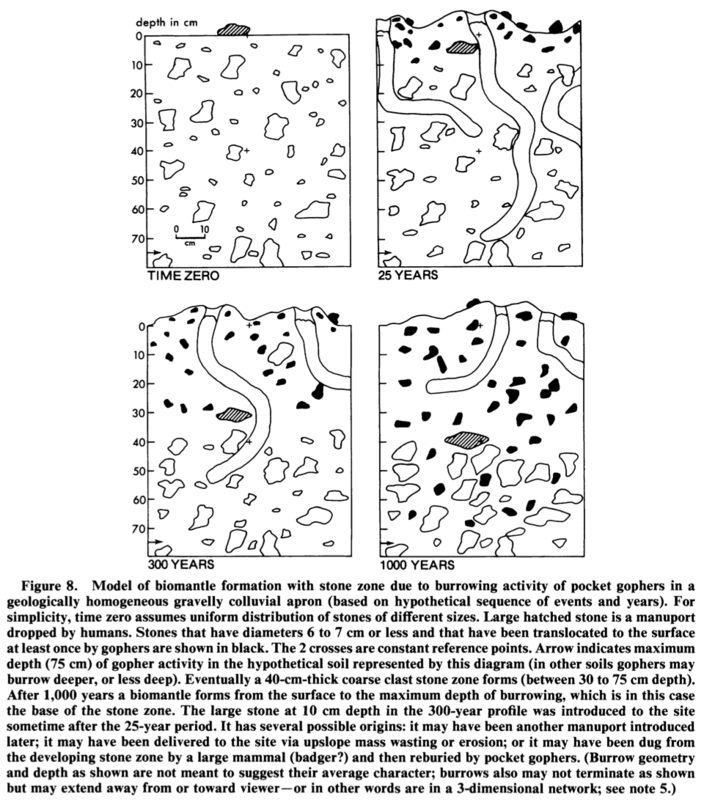 Donald L. Johnson’s three drawings below illustrate what can and does occur as a matter of course in (quite literally) any unconsolidated dirt anywhere in California with the exception of [and I’m guessing here] the area above the tree line. It’s necessary to read the detailed figure captions to make sure you understand what’s going on in each series. However, I’m certain that those of you who aren’t from around here will be astonished and might eventually come to accept why it is no surprise that arbitrary levels are still the state of the art in California. a. the position of the large clasts that weren’t released during excavation. 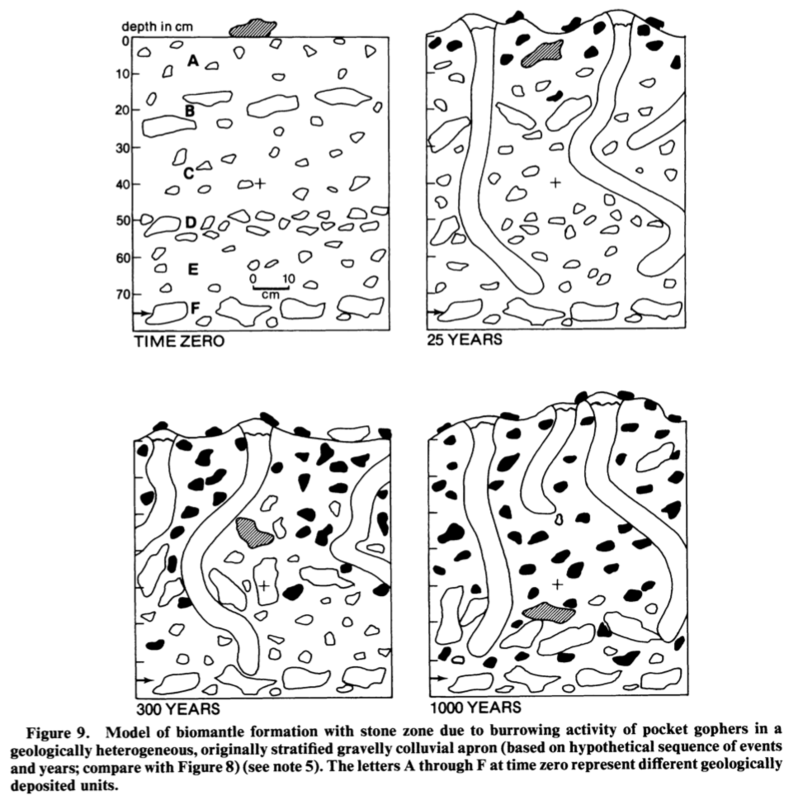 d. any pedogenetical horizonation that may still be in evidence below where burrowing has occurred, which is often the case in what are known as ‘prairie soils’ in relatively xeric landscapes, where illuviation of carbonates creates a relatively rodent-unfriendly consolidated layer at depth. Alas! There’s no remedy for the effects of burrowing rodents on most archaeological sites in California. In fact, the effect I’ve sketched here is so widely distributed and such a virtual certainty that when attempting to ascertain the extent and time-depth of most pre-Columbian occupation sites savvy archaeologists know that one is most likely to find an example of every temporally sensitive cultural indicator smaller than the diameter of a rodent burrow in the top 10 cm of the site, regardless of the age of a site’s cultural sequence. Such is life in California archaeology. I’ll stand up for my California colleagues any day when there’s any question of the professionalism evinced by excavating in arbitrary levels. There’s no other choice. We who’ve worked in California know full well that there’s little point in digging a unit to ‘sterile’ in a site that’s been subject to rodent bioturbation. We know that, more than likely, all we’re recovering is bagfulls of out-of-context cultural artifacts. My new, but long-admired, colleague, Edward C. Harris, MBE mentioned that the people who worked at Playa Vista in southern California told him they couldn’t have done their work without using the Harris Matrix. I’d be willing to bet any money that they were referring to their excavations of the historic remains on that massive project, and not any pristine (nominally speaking) pre-Columbian occupation sites. This entry was posted in arbitrary levels, archaeological ethics, archaeological stratigraphy, bioturbation, burrowing rodents, California archaeology, natural levels, spits. Bookmark the permalink.